VR is now. Where is your strategy? Globally VR is making waves, locally the surf is way too calm. Academy Xi co-founder, CEO and VR educator Ben Wong says the time is now to jump right into the water. Do you have a VR strategy? Have you got good VR developers? Recently Google drew back the curtains on the next iteration of one of its pet projects. Google Daydream View (arguably not the best name) added some much needed structural rigidity to Google cardboard and brought virtual reality (VR) right back into the spotlight. It hasn’t been out of it much since Facebook bought VR second (or is that third, or fourth) coming pioneer Oculus, Samsung got into the game with the Gear VR and HTC created the brilliant but stupendously expensive Vive. But despite the keenness of big hardware brands like those mentioned, there is still a cloud of doubt hanging over the VR landscape — the consumer take up cloud which rains down brand doubt and thunders skills shortages in new digital areas. So is VR destined to be the next 3D? According to Statista, the VR hardware market size in 2020 is predicted to be US$5.2billion globally. The software side is shaping up to be US$24.5billion. The study also states that 44% of people are ‘very interested’ in virtual reality technology, with healthcare, engineering and real estate accounting for the largest enterprise sector interest while, unsurprisingly, video games and live events take up the lion’s share of consumer interest. Note that hardware far outweighs content — I’ll come back to that. The signs are there that VR is about to make a big impact across a number of industries. In fact, the signs have been there for a few years now. Think about technology development over the past 10 years. The Nintendo Wii brought physical actions to video gaming (perhaps the Power Glove did first, but it was WAY ahead of its time) and was swiftly copied by Microsoft with Kinect and Sony with the PlayStation Move. The success of these systems (which weren’t only the realm of gamers but used in marketing as well) soared and then dulled as consumers grew weary of a not-quite-finished technology. At the same time, 3D technology grabbed a few glorious minutes in the spotlight and the slow burn that is augmented reality continued to pique the interest of brands and consumers if not totally grab their undying attention. And then 4K came along. Put these technologies together and it’s all been building up to VR. These technologies have prepped the consumer for VR. Technology that is more real, requires full movement, engages more of the senses and, importantly, is a more encompassing experience. VR is the culmination of years, if not decades, of technological experimentation of its parts. We’ve been dreaming and toying with VR since the early 1900s. Think about Star Trek’s holodeck or the super-old-school View-Master. Finally, the technology is available to make it happen properly. But what about consumer take up? Prepped or not, none of these technologies separately have invaded the consumer sphere like radio, TV or the smartphone have. Consumers have shown solid, if not sustained, interest in these VR prologues. But most importantly, there is a technology that has come along in the recent past that perfectly complements VR and makes it a more holistic and useful technology. One that both brands and consumers will see use in. It’s called Siri. Or Alexa. Or Cortana… really, it’s AI. Useful AI. “It’s clear to me where we’re headed, evolving from a mobile-first world to an AI-first world”, Google’s CEO Sundar Pichai said while launching Google Assistant and Daydream View. 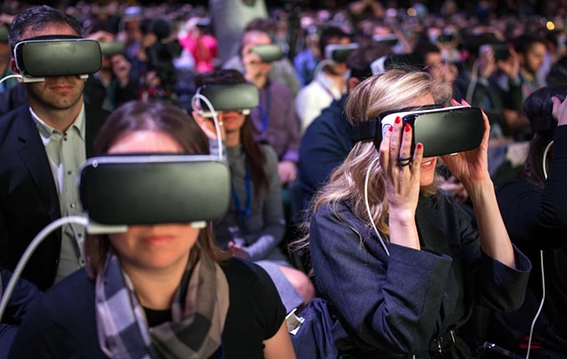 Google is not the only one betting its future on VR and AI — Facebook is, too. The three pillars of its 10-year plan are connectivity, AI and VR. This means one thing — VR (with the aid of AI) has not only piqued the interest of big brands, it’s been entwined in their future planning. For the doubters, VR is real. The headset is NOT the new 3D glasses. So to my earlier point, do you have a VR strategy? While the hardware creators are hard at it, there is a gap in the content market that will only last so long. Get in now, push some resources into VR and provide some VR solutions to your clients or consumers before the VR industry becomes a saturated US$24.5billion market.